Geshe Sonam will use Atisha’s famous text, Lamp for the Path to Enlightenment, as the basis for his Sunday teaching. All are welcome. Atisha, the 11th-century Indian Buddhist scholar and saint, came to Tibet at the invitation of the king of Western Tibet, Lha Lama Yeshe Wo, and his nephew, Jangchub Wo. His coming initiated the period of the second transmission of Buddhism to Tibet, formative for the Sakya, Kagyu and Gelug traditions of Tibetan Buddhism. 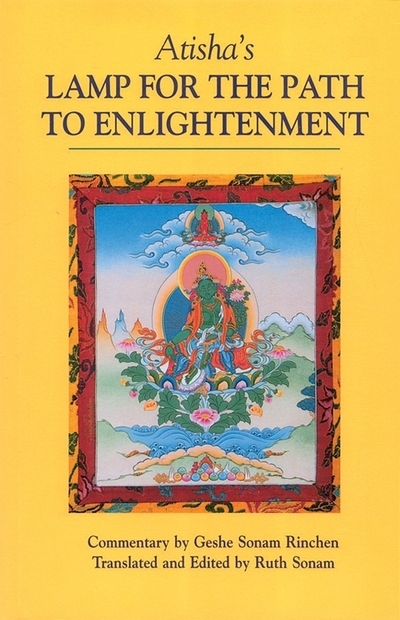 Atisha’s most celebrated text, Lamp for the Path to Enlightenment, sets forth the entire Buddhist path within the framework of three levels of motivation on the part of the practitioner. Atisha’s text thus became the source of the Lamrim tradition, or graduated stages of the path to enlightenment, an approach to spiritual practice incorporated within all schools of Tibetan Buddhism. Atisha summarized all the Buddhist scriptures in his book which is the root text for the Lamrim tradition. The Lamp of the Path divides beings spiritual perspectives into three levels: beginning, intermediate, and highest. Based on that division, the Lamp of the Path shows how to begin, explaining the main activities and emphasis of that initial stage. When that is fully developed and a practitioner reaches the intermediate level, the Lamp of the Path describes the meditations and emphasis at that stage. Finally, it describes the practice of the highest beings, the Mahayanists. Of theses three levels, the first two merely emphasize how an individual can be liberated from an impure life, while the third emphasizes liberating others. Geshe Sonam Rinchen draws out Atisha’s meaning with warmth and wit, bringing the light of this age-old wisdom into the modern world.